I loved this book when I was a kid. 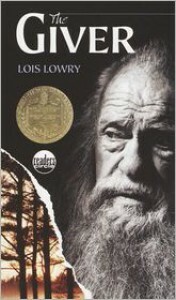 I think I first read it in third grade, and I read it countless times throughout the rest of elementary school. In fourth grade, we read this as a class and had discussions and wrote papers on it. Re-reading this book as an adult, I can see why this book is often taught in schools and why some consider it a modern classic. It's perfect for young readers, because it's written very simply, but there are some "big" or more difficult words tossed in every now and then, which is a good way to learn vocabulary. I remember in class guessing what the word meant based on context clues and then having vocab tests on some of the words when we had finished the book. I typically don't like middle-grade novels, but I did enjoy reading this one. I read it in one sitting. It kept my attention and it didn't feel too dumbed-down like middle-grade sometimes can. This book has an interesting premise -- a seemingly perfect world where there is no war, no murder, no famine; everyone does what they're told and doesn't question their society -- but it just left too much unanswered. Why things are they way they are is kind of explained, but I felt like I had more questions than answers at the end. Speaking of the ending, I hated it. It's completely open-ended, and you're left to imagine what happens on your own. Sometimes I don't mind endings like that, but for me it just didn't work here. This book is the first in a series, but if I remember correctly each book follows a different character, so the ending is never explained. With this book, I wouldn't have minded a happy or a sad ending -- I can see it going either way. But give me SOMETHING. I might re-read the rest of the series in the future, but I'm not dying to get to them anytime soon. I'm kind of interested in seeing the movie because I heard they changed a lot, and I'd like to see if they made the story better or worse. Plus, Alexander Skarsgard. Anyway, overall I would recommend this book to children, but if you're an adult and you haven't read this, I'd say you can skip it and not be missing a lot. For kids, it's a good, pretty simple introduction to the dystopian genre, but I think teens and adults might be left feeling unsatisfied at the end.